If you have fond memories of your meal in Germany, you may want to try a common way of preparing them there. Rather than poach in plain water, make a short stock of the white asparagus trimmings, salt, and sugar, and poach in that. I’ve found it makes a difference, and the remaining poaching liquor makes an excellent liquid for risotto or pilaf. Look who is back!!!! What a surprise to see you here… loved your tips about white asparagus, shall try it, including the risotto move… awesome! Aw, I never really left. It’s just that because of a court order I’ve not been allowed to interact with women for some time. Stupid paternity suits! But I do follow this here little blog of yours faithfully. What a wonderful post! Thanks so much for your generous words! I’m glad to hear you love and enjoy yogurt-poached kibbeh as much as I do…an unknown delicacy! Nice to have you stop by, Maureen! You know, I used to go to a particular restaurant at lunch time, it was a Lebanese buffet type of deal at that time of the day. The owners were a husband and wife team, adorable couple. I always got the same stuff – and here I will use the Portuguese spelling, so forgive me: closed esfihas filled with ground beef, open esfihas with a sharp cheese and spinach topping, kibbeh (the one with a torpedo shape, the shell with the meat dough and ground beef inside). One day the woman insisted I should try the yogurt poached kibbeh, she said she was sure I would love it – the looks are not that appealing, as you know… but I trusted her. MY GOSH. Never looked back. Every single time I went there, that would be my main component of the meal. This sounds delicious. 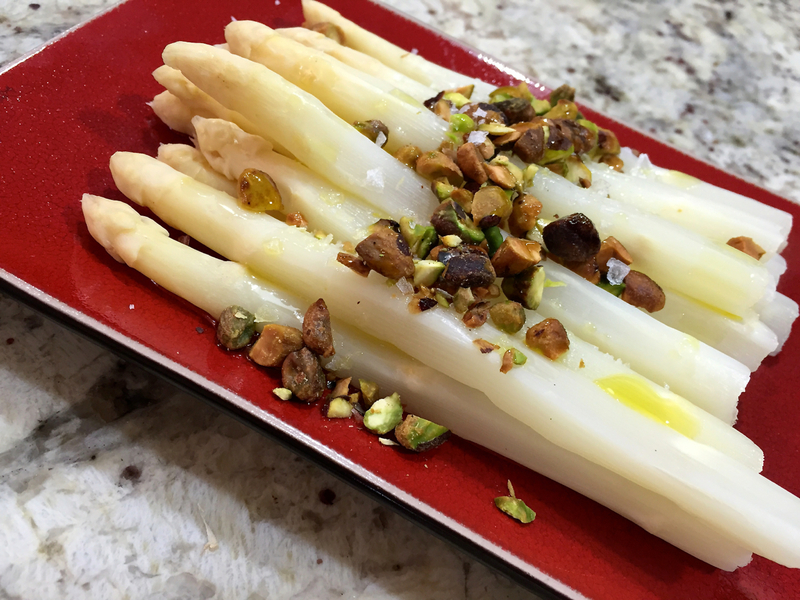 I have a silly question though – does white asparagus taste different? I’ve never had it, though we’ve had the green variety almost weekly. The pistachios would be a winner with the boys in this house for sure! Aha, I see, then it must be good!! 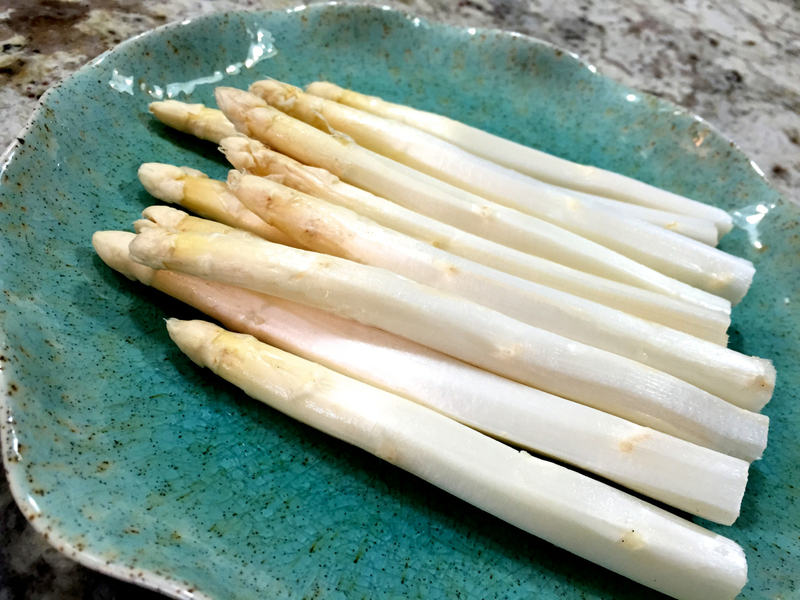 I’ve never tried white asparagus. It seems so much more elegant than the green variety. It’s certainly a pretty presentation on the red plate. I learned to eat and love white asparagus during our yearly trips to the famed Hannover Trade Show: on at the same time as the asparagus season:) ! What a simple but fantastic recipe: now to find the white of the species in rural Australia – such a very simple moreish recipe too! And love the sound of the oil and would so like the book [cookery book moratoriums notwithstanding] . . . . just have to have those kibbeh recipes 🙂 ! Here is what I say to you… some women spend incredible amount of money buying shoes. Having weekly pedicures, monthly haircuts, dye-jobs, new clothes. A cookbook is culture. It is pleasure, it is part of making a house a happy home. Sally dearHeart – go back a couple of decades and I would be the first to open the papers on Jourdan, Ferragamo, Magli and all else: an absolute ‘shoe freak’!!!! *Warmest laughter* I guess I have kind;of ‘grown up’ . . . know what I squish to my heart and laugh and love and take to bed . . . and even cook from . . . [sugar, what happened to English grammar 🙂 !!] all those paper bits with pretty pictures . . . [Oops, hate to tell: am awfully good at stying my own hair over the bathroom cabinet also:) !] Thank you for a big smile: it counts !!!! Just the right amount of prose, heeheeh, I know exactly what you mean; that elusive balance we all try and achieve. I struggle with that a bit myself. Some weeks I feel rather mute, other weeks chattier :). What a lovely sounding dish, yes elegant as you say. I haven’t used white asparagus in a couple of years now — what a pretty contrast it provides against the vibrant green of the pistachio. And is it just me, I’m not sure I could resist drizzling the whole affair with a touch of honey :D. p.s. love the title of Maureen’s book. I also love the title of her book, so poetic! and you are right, the perfect balance is something that probably every blogger (writer) strives to achieve. Not easy…. That cover photo alone would be enough to make me buy the book!! 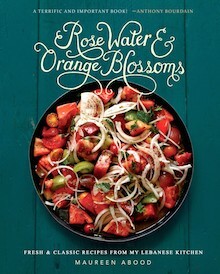 I love a good MIddle Eastern cookbook..those flavors just speak to me. Love how simply this asparagus is prepared, yet so full of flavor! i have never eaten white asparagus and would over to try it. I love how foods leave a memory. The first time I had asparagus was when I was 18 it was with creamy mushroom sauce. I loved it and since have been a big fan of the vegetable.